That is OK if it is a high school team that has the same group of groomed players for 3-4 years the wins state. Not so much for a pro team that was not so great to begin with. I suspect that 2022 will be the Mariners year! Can’t wait! That'll be so cool! Then I can ride the light rail down from Lynnwood for the M's WS victory parade rather than fight Seattle traffic! Or maybe even your flying car! You'll of course want to watch out for recently-evolved pigs who will be sharing the same airspace! The Mariners have traded Cano, didn't resign Cruz, luckily unloaded Zunino, Guillermo, Gamel, Paxton, Diaz, Colome and may be trading Haniger. For some strange reason they want to keep Seager? Maybe 50 wins next year, accidents can happen, but building for 2025 or 2030. Good to know. As my time will be better spent taking a walk than watching another bumbling loss. They should just step down to AAA...maybe then they could be competitive? For some strange reason they want to keep Seager? It's not that they want to keep Seager, it's that his contract basically makes him untradeable right now. He's owed 70 million over the next four years, and he just put up the worst season of his career. He has pretty much no value at the moment, plus with Machado still unsigned, the market for a 3B is currently up in the air. If Seager turns things around during the first half of '19, I expect to see the team try to move him before the ASB, but not gonna hold my breath. Seager is great on defense but is almost a guaranteed rally breaker with men on base. He and Zunino. Well they are the farm system for other, more traditioned teams. Some of my favorite Red Sox of all time were originally Mariners! 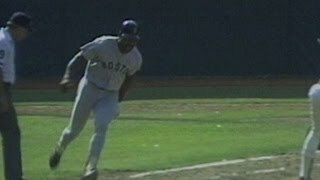 Some of my favorite Red Sox of all time were originally Mariners! Yeah, but the M's really, really needed Dave Hollins and Heathcliff Slocumb to continue their drive to glory in the '90s. Arias(Ortiz), Lowe & Varitek were, y'know, just prospects. M’s will win pennant same year fusion power becomes commercially practical. I didn't realize Henderson had died. He always seemed like a really nice guy with an extremely positive attitude. It's interesting to see that Hendu actually had better stats with the Mariners than in his 111 games with Boston. His best statistical seasons were later with Oakland. IIRC, there was some tension between him and the M's in his playing days, probably resulting from his flair while playing, which was viewed dimly in those days but seems more accepted now. I was glad to see him back with the broadcast team in recent years. And yes, he always seemed to have a smile and a very positive attitude.